Transforming a sheet of silver into a piece of jewellery can be a fulfilling and exciting creative process. This intensive two day course will introduce you to the traditional techniques and tools used to make jewellery. 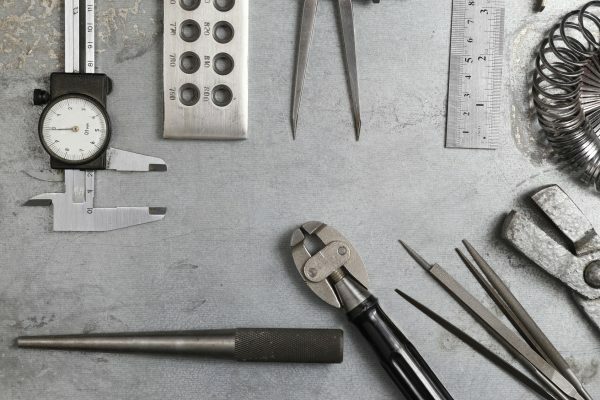 The aim of this course, using demonstrations and structured guidance is to instil confidence as you learn techniques such as sawing, soldering, annealing, filing, texturing and shaping to create a piece of silver jewellery during the course and when you continue making afterwards. You will start by using copper (which has similar working properties to silver) to practice on, then progress to using silver for your final piece. This course is an ideal introduction if you are taking your first steps in jewellery making or suitable for returning students looking to refresh their existing knowledge to create more complex pieces. Copper, a small amount of sheet silver and all tools will be provided. Extra silver can be purchased at cost during the course if needed. The weekend is designed to be as flexible as possible, allowing you to build your skills as well as create a finished piece. Please bring along glasses if you need them and wear appropriate clothing for a studio environment including closed toe shoes. If you have long hair please wear it up. 9:30-4:30 each day with a break for lunch. Lunch is not provided but you can bring a lunch to eat in the studio or we can advise you of nearby places to buy a lunch. Refreshments provided.